These Zucchini Fritters are loaded with feta and herbs. They are so light, fluffy and delicious. I promise the picky eaters who always resist eating greens around you will be begging for more when you pair them with yogurt dip or sour cream. They are the summer party food at its best! What’s your favorite snack during summer? No, not sweet. I’m asking the savory snack you are addicted to. Between you and me, I can’t stop eating zucchini fritters once I start. These are so good that I eat almost half of them when I am frying. They are perfectly golden on the outside and moist on the inside. They are not very crispy because I don’t make them very thin. On the contrary, these are thick and fluffy. Plus, you don’t taste zucchini, which makes this a kid-approved zucchini fritters recipe. What are fritters made of? You can make fritters with any vegetable, but zucchini is the most preferred one in Turkish cuisine. There are three reasons why moms generally use zucchini for fritters. First, it helps digestion system of body. You don’t feel bloated when you eat fritters made of zucchini. Secondly, kids never refuse to eat these zucchini packed fritters. 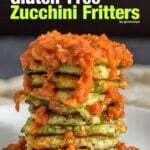 Knowing these, moms make zucchini fritters to make their children love this light vegetable. As this is not a main dish, moms generally make these as a snack before dinner time when their children come back from school. The last reason for moms to prefer zucchini for fritters is that Turkish women want to use up the zucchini pulp after they make stuffed zucchini. We scoop the center of zucchinis and store the pulp in the fridge to make zucchini fritters the next day. To make classic fritters, combine shredded zuchhini with eggs, flour, baking soda and cheese, feta in our version. Optionally you can add your favorite herbs like parsley, dill, mint or green onions. Though baking powder or baking soda is not a must for fritters, use it to make your fritters fluffy. If you are more on the side of crispy fritters, you really don’t need them. Make sure you drop the batter in the pan in a thin layer then. You can do this by gently pressing on the batter you drop in the pan with a tablespoon so that you have flat and crispy fritters. On the other hand, you will be impressed by the result when you add baking powder. It gives them a wonderful fluffy texture. Grate the zucchinis using a grater or in a food processor and squeeze out the juice as much as you can. To get rid of the juice, sprinkle a little salt over shredded zucchini, let them sit for about five minutes and squeeze in your hands in batches. Although this step sounds like extra effort, don’t skip it. You will end up with soggy fritters otherwise. Our favorite way to enjoy these fritters is with some Yogurt and Cucumber Dip aka Turkish cacik on the side. Another great dip to serve with fritters is Turmeric Tahini Dressing, which has become our new obsession. You can also pair these with a sour cream dip like Sour Cream and Chive Dip from Iowa Girl Eats. 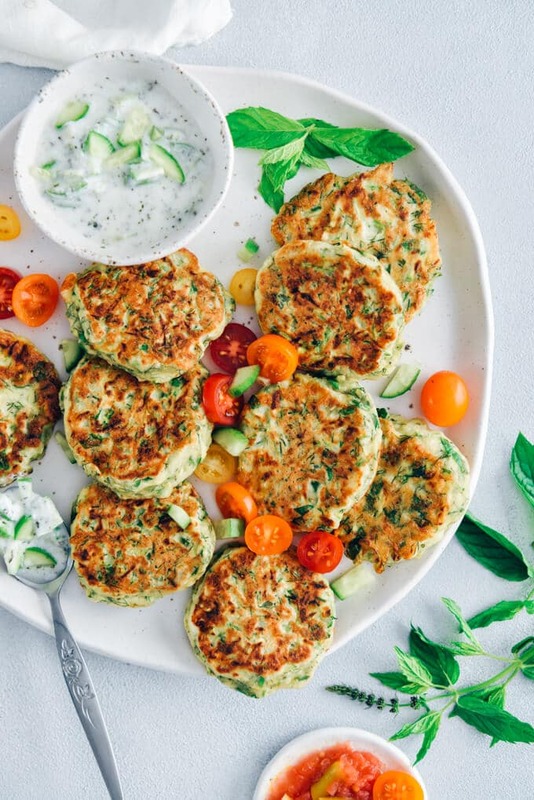 Zucchini fritters loaded with feta and herbs. So light, fluffy and delicious! Squeeze the shredded zucchini with your hands as vigorously as you can to remove their juice. Do this in batches and put the squeezed zucchini in a large bowl. Beat the eggs in a small bowl and then pour it over the shredded and squeezed zucchini. Add in feta cheese, herbs, baking soda, flour and salt. Stir until combined well. Heat a non-stick skillet over medium high heat. Pour 1/2 tablespoon olive oil in it. Using a tablespoon or an ice cream scoop, drop zucchini batter in the pan and gently press with a tablespoon or a spatula. Cook about 3 minutes on medium high heat and carefully flip them over with a spatula. Cook the other side about 3 minutes. If they cook too quickly, reduce the heat to medium. Remove the fritters from the skillet and place them on paper towel. The amount of salt depends on how salty your cheese is. If it’s too salty, you might need to add less. If it’s not, add more salt. To squeeze as much juice as you can, sprinkle salt over shredded zucchini. Let it sit for 5 minutes and then squeeze. This post was first published in 2009 and has been updated with new photos and additional information. Hi Tammy! Yes, you can bake them. You can drizzle a little oil over each before baking. Such an incredible summer recipe. Love all your zucchini recipes so much. Keep ’em coming. I am going to Turkey tomorrow for the 4th time in 2 years – I just love the food! I added your Mucver recipe to my blog and I hope you don’t mind, it’s excellent and never lets me down! Mucver is a favorite of many of us here. Glad you love it too. No problem for me as long as you give a link to that post. And I hope you try enough Turkish food when you come here. I LOVE zucchini fritters. I never made them with feta cheese, my daughter’s favorite cheese, so I will have to try this. Thanks! Delicious meal. Thanks for sharing. I would like to know, what kind of feta cheese do you use?